Upon arrival at Grootbos you will be greeted with warm moist towels, and friendly staff. Even though check in is from 2pm, you are encouraged to arrive at 1pm to enjoy lunch while sitting in the al fresco area overlooking the bay. As we sat down we were given a ginger beer drink with citrus fruit, which I tasted and it was sublime. I left the rest for Dave to drink, and the staff were right there to offer me something else. I chose to have tap water, which was served in a pitcher which was left on the table for me to help myself to if I wanted more. Check in is handled at the table by a guide and seems to be a more informal and personal way of dealing with this necessity. Our car keys were collected from us and our car moved to the lodge parking and our suitcases taken into the lodge. We were handed our keys and shown which path to take to our lodge. We were in lodge number 9, and the setting is beautiful. 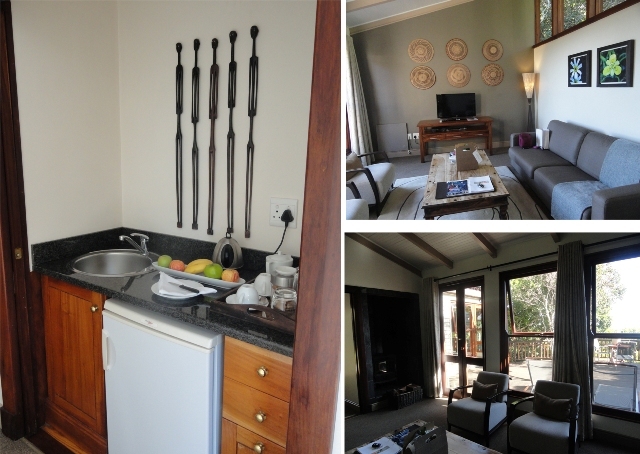 This is a luxury suite in the Garden Lodge at a cost of R4700 all inclusive for the night. I loved the ‘kitchen’ set up which consisted of a prep bowl, mini bar fridge, drawers and cupboards. The mini bar is well stocked and a bottle of mineral water costs R11 and a 375ml bottle of wine costs R115. There is a good tea selection but I was not impressed by the coffee. Normally I would want a mug to drink from, but the coffee was not strong enough for mugs, let alone the cups. The biscotti was scrumptious and I could not resist a second one. There are sliding doors which close off the area if you want to hide it away. The bedroom has decent bed side lamps, a bedside clock on one of the two bedside tables and a vanity table where you will find the phone. There is a plug point under the table for your hair dryer, chargers etc. The bed is comfortable and king size and there is a foot stool at the end, which I kept walking into in the middle of the night! The pillows are huge and soft and extra blankets can be found in the dressing room. The foot area as you get out of bed is heated with under carpet heating which I found unnecessary but left on nonetheless. I appreciated the black out curtains and could not believe it was 6.30am when Dave got up as the bedroom was totally dark. We sat and drank coffee in bed, with the curtains open and the light streaming in. The rooms are artfully decorated, the furnishing luxurious and both the lounge and bedroom have an air conditioner unit. Off the bedroom is a walk in closet which has space for the suitcases, and the safe. There is a spray bottle of peaceful sleep to combat the mosquitoes, proper hangers and a hair dryer, as well as the laundry basket. The lounge is well appointed and comfortable and there is a flat screen TV, DSTV and a DVD player. There is a sleeper couch in the lounge but I did not find any extra bedding. There are panel heaters in each room which I am sure will come in handy in winter. The lounge also has a fireplace which we did not try. Off the lounge is a deck with loungers, a small table and chairs. In the entrance hall you will find umbrellas and a fire extinguisher. Amenities are from Charlotte Rhys and can be found in the main bathroom. We were provided with shower gel, body lotion, soap bars, hand soap, shampoo and conditioner. There were shower caps, a vanity kit, sewing kit and a nail care kit. In the second bathroom there is a huge bath overlooking nature! There are bath salts and floating candles, a candle, soap and a chair. Both bathrooms have heated towel rails and the main bathroom has undertile heating. There is also a shower point in the bathroom which I fear might be a tad too far from the vanity to allow you to charge anything as the cord might not reach. I chose to wallow lie in the bath after our cave walk and before dinner and enjoy the view. The tap is in a bit of an awkward position but it was a relaxing way to end the afternoon. There is an abundance of towels as well as waffle weave robes and as I use 2 towels at a time I really appreciated that there were enough. The shower has two shower heads both of which are the ‘rain’ type which personally we don’t like. The taps in the shower are not of the same quality as those used for the double basin vanity, and work opposite to what you would expect – you need to push them in to turn them on! Attention to small details is not clearly visible in the lodge. There were dead bees in the second bathroom and a blown light bulb in the main bathroom. The turn down service includes the cleaning up of the bathrooms and so this should have been picked up at the same time and the bulb changed. Once you have gone for dinner the staff come in and close all the blinds and curtains and the turn on all the lights. Bottles of water and glasses are placed next to the bed, which neither Dave nor I could open. Before heading out for the afternoon activity we made our way back to the swimming pool to test the various chairs and couches and straight away we were brought a pitcher of tap water. It is this attention to detail that makes a place worth visiting. We sat under the umbrella for a bit just soaking up the view. The pool deck has loungers and there is a basket with towels, sunblock, caps and sunglasses. Tea and coffee is served at all hours and when we left we stopped off at Forest Lodge to take a look, and to have a final cup of coffee. We were not charged for this which was a wonderful gesture. The bar service is also available at all times and the cost is added to your bill without you having to sign for anything. Baby sitting is available by arrangement from 7pm at a cost of R60/hour until 11pm and R80/hour thereafter. Grootbos also offer a courier service as well as facilities for faxing, emailing and internet. There is also a postal service and messages will be taken on your behalf. There is a selection of DVD’s on offer to use in the lodges which I did not look at. There is wifi at Grootbos which my PlayBook could locate, but I was unable to logon as we were not provided with a login password. I didn’t need the wifi so I did not call up to reception but it would be a nice touch to have been given the information when we checked in. Given that Grootbos offers many guided activities all the staff are trained in First Aid which I find very impressive. There has clearly been an investment in staff training and the staff work at both lodges on a rotation basis. Payment can be made in foreign currency and if you are looking for luxury and individualized attention then Grootbos is the place to be! The actual layout of the cottage is fantastic and you feel like you are the only people staying there. There is an absolute sense of privacy and quiet. Disclosure: Dave and I were invited to spend one night at Grootbos in exchange for a blog post about their month of love promotion, and a blog post about our visit. We were responsible for the payment of our drinks and any other additional charges. This post is in line with my blogging policy. I have broken down my experience into three posts. This is the first. We just stayed at Grootbos this winter. We had grand plans of going shark diving, etc., but got a nasty winter storm instead. So we hunkered down in our room (looks like we might have had the same room) and read a good book by the fire before going wine tasting. Totally agree with you: it’s perfect for peace and quiet! Wow ! What a classy place it is ! It is really lovely. Thanks for sharing. What a lovely place, I can imagine how great and relaxing it was for you. it is very relaxing and quiet! Good to have a glimpse into Garden Lodge – looks just as lovely as Forest Lodge, I’m still enjoying the memories! Ah, this address will be added to my travelling list – thanks, Tandy! ahhh, what a wonderful get away…need one pronto! I like the step-down bathtub!